Claims management is the lifeblood of your medical practice or billing service. How your medical billing software handles claims is very important. All software can send claims electronically and on paper. The question is, does it do it well? Give your software vendor a run for his money. How do I create and bill claims? How do I rebill claims? You should be able to easily bill claims and go back and rebill them without too many mouse clicks. Sometimes you need to rebill one claim or many claims by carrier and you should be able to do all this easily. All software has claims management features, the question is how many hoops you have to jump through to get the job done. Time is money so you want your vendor to explain how claims are processed. Can I rebill unpaid claims en masse? I seldom recommend doing a mass rebilling of unpaid claims but your software should be able to handle it. If you take over the billing for a practice, it is nice to be able to do a blanket rebill of all your unpaid claims. You might get lucky and be paid without having to make a phone call to the insurance company. Does the software provide proof of timely filing? All medical billing software should provide you with a means to prove to an insurance company that you sent a claim on time. Believe it or not, there is software that doesn't do this or doesn't do it to the satisfaction of your insurance carriers. Can I split or merge claims? Your software should be able to identify, slice and dice claims in a variety of ways. Sometimes you will be paid on all but one procedure and you should be able to rebill just that line of the claim. Which clearinghouse will I use and can I send claims for all my carriers? Can I use another clearinghouse if I want to? Clearinghouses have a list of specific carriers they send electronic claims to. What happens if your practice is contracted with a local HMO and the clearinghouse in question does not send claims to that carrier? Most software will allow you to send a print image of your claim to another clearinghouse if needed. Review the medical billing clearinghouse page for more information on this subject. What kind of claims management reports can I run? One of the most important reports you will need is a primary insurance aging. This report should have all the relevant information you need to make your insurance calls to follow up on unpaid claims. You should be able to limit the report by aging date. Additionally, you should be able to generate reports with statistics that reflect number of claims, payments per carrier and turnaround time. Does the software offer paperless claim management followup? Many systems offer a claims "worklist" to view and followup on outstanding claims. You can enter notes and schedule insurance followup calls. The worklist is recalculated daily and will only reflect the claims to be worked on. This avoids having to print paper insurance aging reports. Additionally, it allows you to followup with insurance carriers every day if you want to because of the automated followup system. If your software has these features, then your claims management will be faster and more efficient. Medical-Billing-Guide.com 53 Charro Drive Santa Rosa, CA 95401 © Copyright 2008 Medical-billing-guide.com No reproduction permitted without permission. Download it now for just $49! A step by step guide for new medical billers on a budget. Bonus material includes: sample marketing postcard, contract, and many forms you can modify and use. ICD-10 implementation is effective 10/01/14. 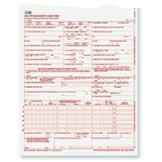 Here's an example of the new CMS-1500 02/12 claim form. We know it's great software, but don't take our word for it. Take a test drive. Download TotalMD today! Improve your practice bottom line. Learn the best tool of the trade to improve your Patient Collections. Medisoft online training program Combines online videos with live coaching to offer you fast and easy training at half the cost. What's new? Visit our blog for straight talk on collecting Medicare EHR incentive funds. Why are my paper claims getting rejected? Find out the most common errors on your CMS-1500 or Hcfa form. Implement these Medical Billing Collection tips and improve your practice bottom line.